I designed this info graphic to accompany a story I wrote for a city government assignment in a reporting class at UT. 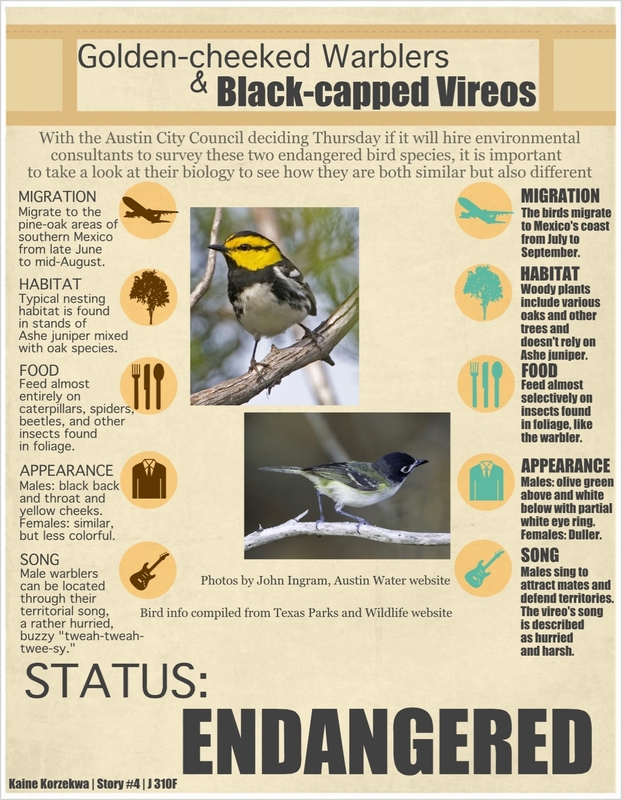 The story focused on the city of Austin’s intent to hire environmental consultants to survey for the presence of two endangered birds, the golden-cheeked warbler and the black-capped vireo, on land owned by the city. I designed the graphic using http://www.easel.ly to compare to the two bird species being surveyed. Click on the image to see an enlarged version. I shot, produced and edited this video for the intense multimedia class in UT’s School of Journalism called Reporting: Images. I interviewed farmers and ranchers back at my hometown in the Texas country. I shot, produced and edited this video for the intense multimedia class in UT’s School of Journalism called Reporting: Images. I traveled to two of the Johnson’s Backyard Garden locations to interview participants. If you are looking for a local spin on science, tune to KVRX every Monday at 8:30 p.m. to catch “They Blinded Me with Science,” a radio show produced by graduate students in the College of Natural Sciences. And if you miss that, check out the podcast. “It’s poetry in motion,” sings Thomas Dolby in the radio program’s namesake song, and indeed, grad students Nichole Bennett, Amanda Perofsky, Stavana Strutz and Michael Gully-Santiago bring the poetry of science to listeners’ ears weekly, covering research from UT Austin and around the world. We sat down with the crew to ask how they came to be a part of the show and what role they think it plays in science. Why do you think a show like this is important? Amanda: I think it helps people see scientists as more approachable. There is this stigma that scientists are very pretentious, but we’re all just normal people who happen to be scientists, and I think the way we have discussions on the show helps people understand that. Gully: From the listener point of view, they now have access to what’s going on in UT science. I think that’s really awesome. There are other outlets, but at least for now the radio and the podcasts I’ve been pushing are an easy way to get a digestible automatically downloadable format. The podcasts provide some real tangible thing that lasts beyond the fleeting airing of the show. Do you think it brings anything to the communication of science? Stavana: I feel like entertainment media is dominated by a lot of junk information, and so I feel what we present is real solid information. It’s facts in a fun-to-listen-to sense. And you know in the United States in particular science is sort of constantly being challenged, and so in a state like Texas I think it’s important to promote science. Nichole: And on the flip side of that I sometimes feel like the radio show itself helps train our guests to be able to talk to the public. If you do some big research project and you get called by CNN you need to be able to kind of do that one line thing and get across your science but still keep the pubic engaged. I feel like we do a small part in trying to help with that. Do you think the show makes you a better scientist? Amanda: I feel like the show helps me be well rounded in terms of my scientific knowledge. If I were just left to my own devices I would probably just read infectious disease papers all the time and not necessarily branch out. Especially with having an astronomy person on the show I have learned a lot. I learned all about what the Higgs Boson is, for example. Gully: We really have our pulse on what’s going on at UT because we’ve interviewed so many people now we sort of know what’s happening. Sometimes we have shows focused on national news where we just talk about current news instead of bringing on a guest. That also helps us keep our pulse on science that’s happening here at UT and around the world. What are some of the coolest shows you all have done? Nichole: We did a Valentine’s Day show on the science of kissing, and a Halloween show on the epidemiology of a zombie outbreak. So we pretended like it actually happened and how we would model it and how it was all kinds of hopeless, depending on the properties and transmissibility of the zombie outbreak. We also did a Sasquatch species distribution model. But the distribution of Sasquatch just happened to line up with the distribution of the black bear. So that’s a better explanation. We’ve done some fun shows. Stavana: There is always something cool we learn on every show. There is always a crazy experience the guest scientist had. We have guests that come on that talk about all of their interesting adventures, like getting held up at gunpoint by poachers in India while looking at rare species of birds. Those are the kinds of things that get people excited about science. How did you get started in the radio show? Nichole: I joined my first year of grad school and am now the veteran member. I had always done college radio as a kind of hobby. Then someone came to me and said, “Oh, we have a science show and you should join it.” And honestly I wasn’t really comfortable at first having my music life and my science life interact. But actually it’s a really great way to learn how to talk about your research. Gully: So I got involved originally as a guest in December of 2012. I then sort of just started coming on as a host the semester after that. It was just occasionally at first and now I’ve more or less been doing it pretty steadily this summer and fall. I was also the one that started the podcasts. Amanda: When I was interviewing for grad school here I mentioned to someone in our department that I wanted to DJ at the radio station because I really enjoyed being a college radio DJ in undergrad. That’s when someone told me about the science show and said that I should meet Nichole. In college I had thought it would be cool to do a science talk show but I never had the initiative to start one up on my own. When I came here it was just something I could join right away. I’ve been doing it for two years now. Stavana: I was a guest in September 2012. After that I became a regular guest, really. Then, Nichole told me, “you’re a good guest speaker and I’m leaving for five months to Japan so can you come on and fill my shoes?” I was very happy to do it. It’s a great opportunity. We are also really glad Gully is here so it’s not just biologists. “They Blinded Me with Science” hosts Nichole Bennett, Amanda Perofsky and Stavana Strutz are graduate students in the Ecology, Evolution and Behavior program. Michael Gully-Santiago is a graduate student in Astronomy. The following is a Q&A with Mason Hankamer, a neuroscience and jazz performance major, which will be featured in our alumni magazine. Along with interviewing Mason and putting the piece together, I was the one who pitched the idea at an editorial meeting. I chatted with Mason for nearly an hour to get to the bottom of this interesting choice of majors. It is one of four Q&A’s going in the magazine; we are also featuring a graduate student, a professor and an alumna. And how did you realize you wanted to add jazz performance as a major? I’ve always really loved music. Doing neuroscience by itself just felt like there was an empty hole, but at the same time, if I were just to do music there would be this entire gap where my academic thinking was missing. How do you think the two majors come together for you personally? I have what’s called color synesthesia, where I see music in colors. Certain sounds and instruments have different colors. For example, a song could be deep purple with sharp streaks of orange. I like playing bass instruments because they produce a dark blue color to me. When I compose, it’s like I’m painting a picture. I don’t actually see them physically; it’s more the aura of the color, which is difficult to explain. What really links the two is that we studied the condition once in a neuroscience class. It was really neat to actually learn and understand why I experience this. What are some ways you think music and the brain are connected? I am always thinking about music. Just humming a song in my head during class makes me ask so many questions. How and why do songs get stuck in your head? How and why does this song make me feel this way? I think it’s amazing how music completely inundates our entire lives. Take a look at ACL [Austin City Limits Music Festival]. Walk across campus and see everyone with their headphones. It’s a weird force that controls a large portion of our lives whether we think about it or not. There has kind of been this cultural phenomenon created at the intersection of music and the brain. The following three short clips are the Science Essentials section in the first edition of the College of Natural Sciences’ alumni magazine. For these pieces the participating faculty had two options: they could write something up that I would edit or I could interview them and ghost write something for them to look over. All of them chose the interview option. Regardless of the approach, the short articles will appear in the magazine authored by the faculty member but the interview, tone, organization and editing are from me. I worked with the professors to narrow their focus and pull their thoughts together into an easy-to-understand narrative. There was a time when we thought we were special, that our sun was the only star with planets. Now, we know better. When I started in this field, we were just barely predicting the presence of exoplanets — planets that orbit other stars — and now we have proven the existence of more than 1000. The count is climbing every day. As we looked at the sun and wondered why we have planets here, we compared the sun to other stars and were a little disappointed. We realized the sun is not special. The sun is just like all of these millions of other stars out there. There’s absolutely nothing about our star that would lead to us to think there should be planets here and not elsewhere. So when we started looking and finally figured out how to take the measurements and do the calculations correctly we figured out that all of those other stars out there also have nice planetary systems around them. Current estimations say that every star has at least one planet orbiting around it. It sort of puts our role in the universe into perspective — we really aren’t that special. You know this is one of the last places where humans can do exploration. Hundreds of years ago people would jump in a ship and find new worlds and now I go up to my telescope to find new worlds. RNA has come a long way in just a few short years. Once the ugly stepchild of the nucleic acids, it was thought to be a boring and simple message decoder (Remember the Central Dogma?). RNA, a polymer composed of four different nucleotides connected by a sugar ribose backbone, took a backseat when researchers discovered DNA was the genetic material. RNA does serve as the intermediate between DNA and proteins, decoding the DNA and then being translated by the ribosomes that make proteins, but that is only a sliver of its diverse set of functions. The molecule has very interesting structural and enzymatic functions, making it similar to proteins. A large amount of what was once thought of as “junk DNA” is actually transcribed into RNA and used for a variety of functions. Given the vastness of these RNA and their potential to unravel numerous mysteries of biology, collectively the RNAs have been referred to as the “dark matter” of the genome. Regulatory RNA, for example, seem to turn on or off certain genes. These small RNAs can be synthesized and used to silence any gene, and this has exploded into a multi-billion dollar industry known as RNA interference. MicroRNA, another type, serve as dimmer switches during gene expression, and are involved in almost all aspects of development and disease. Despite this, we only understand the functions of a miniscule fraction of RNA, so clearly more fireworks await discovery. The vast functions of RNA have even led scientists to theorize that life started in an “RNA World,” where RNA came first because it can perform so many processes and DNA evolved as the genetic material later. Our understanding of the structure of an atom hasn’t changed since the early 20th century, but the way we visualize them certainly has. Scanning tunneling microscopy (STM) is now the norm, and it is a critical tool we use to visualize atoms and molecules and understand their structure. We have all learned how electrons occupy regions of space around atoms, called “orbitals.” However, it turns out these electrons sometimes move outside of their atomic orbitals. This happens in such a predictable manner that if you put two objects very close to each other they will begin to share electrons. In STM, we literally take an electrode and bring it very, very close to the surface of the material we’re studying. We get it so close that the materials begin to share electrons, which in turn creates a current. This current is what we can measure. The properties and function of a material are determined by its structure. We used to not be able to see the individual atoms and molecules of these materials, but now that we can using STM, the mysteries behind many materials have been solved. That’s really what chemistry is all about right now — understanding how the properties of individual molecules combine and work together to create new properties in both artificial and biological materials. Some, for example, have used the technique as a tool to pick up and drag individual atoms and molecules, literally organizing them. If we could do this on a large scale, it opens up all sorts of completely new fabrication and synthesis mechanisms. 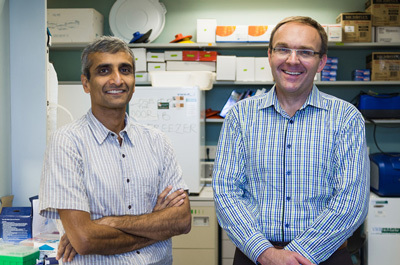 Vishy Iyer, professor of biology, and Matt Cowperthwaite, research director of St. David’s NeuroTexas Institute. Photo by Alex Wang. Symptoms can start as headaches and nausea. If ignored, the tumor continues to grow, putting pressure on other parts of the brain. Seizures appear. As the tumor’s size increases further, the pressure in the skull becomes life threatening as even far reaches of the brain are bruised against the skull. This begins the progressive deterioration of personality and memory. Before surgery — even before symptoms appear — a cancerous tumor starts as what can only be considered a freak accident: a mutation, a random change in a cell’s DNA that leads to uncontrolled cell division. Different mutations cause different cancers and even different molecular subtypes of cancers. Using these mutations to classify subtypes could lead to better, more personalized treatments for glioblastoma. That’s what Iyer — in collaboration with Matt Cowperthwaite, director of research at the NeuroTexas Institute at St. David’s HealthCare — is hoping to be able to do. Iyer and Cowperthwaite are taking advantage of two resources: the Austin Brain Tumor Repository started by Cowperthwaite and a technology known as next-generation, or “next-gen,” sequencing. DNA sequencing is the process by which scientists determine the order of the nucleotide bases — thymine, adenine, guanine, cytosine — in a piece of DNA. Next-generation sequencing, a concept first developed in 2004, provides a way to perform this task more quickly and less expensively. Conventional sequencing processes can process DNA at approximately 100,000 bases per day with a cost of about 5 cents per base. Iyer’s group uses the next-generation sequencing techniques to sequence roughly 1 billion bases per day at about 0.00002 cents per base. What this sequencing will allow them to do, said Cowperthwaite, is get a better insight into the individuality of tumors. The researchers believe that a source of these differences may be mutations in or around molecules known as transcription factors. To identify these mutations Iyer is using a technique that can essentially identify and isolate what part of the DNA the transcription factors associate with. That DNA is then sequenced specifically in search of mutations. “Our project is taking a unique approach by focusing on the cancer’s regulatory pathways and the DNA mutations that take place inside the tumor’s regulatory pathways instead of sequencing the entire genome of the cancer like many researchers are currently doing,” Iyer said. The project uses a sort of double comparison. Iyer and Cowperthwaite have access to both tumor sample DNA and blood sample DNA for each patient. First, they compare these two samples to see what mutations are unique to each tumor. Then, because Cowperthwaite has given Iyer access to many glioblastoma samples, they plan to compare the mutations against those in all of the other tumors using sophisticated computing software. Cowperthwaite started the Austin Brain Tumor Repository in 2011. He and his team work closely with neurosurgeons and neuroncologists to learn of tumor operations taking place at the hospital. Determining the patterns of different mutations in different tumors will allow the team to identify molecular subtypes of the cancer. The hope of the researchers is that this information can one day be used to develop personalized therapies for cancer. Although Iyer and Cowperthwaite are still trying to identify the molecular subtypes of glioblastoma and years of more research would be needed to produce these specific drugs, there are several possibilities for treatment if the dream is realized. If the cancer is caught in an early stage, its growth could be halted by disrupting the specific pathways that keep it dividing and functioning. At later stages there is the possibility of removing a large part of the tumor and then stopping the growth of what remains. This could result in permanent remission.